WALT DISNEY'S FUN AND FANCY FREE ORIGINAL LOBBY CARD. This card features a fabulous scene with Mickey Mouse sticking out of Willie the Giant's sandwich! The film features the voices of Edgar Bergen & Charlie McCarthy, Dinah Shore, Billy Gilbert (as Willie the Giant), Cliff Edwards (as Jiminy Cricket), Clarence Nash (as Donald Duck), Pinto Colvig (as Goofy) and Walt Disney in his final movie as the voice of Mickey Mouse, along with The Dinning Sisters and The Starlighters. This is one of two beautiful lobbies from this film that we have up for sale this week. We are also offering a beautiful set of Pinocchio lobby cards, so you may want to check out our other listings. To see these awesome pieces. CONDITION: This classic lobby card is in NEAR FINE condition, with only a slight bump on Willie's left cheek. Please refer to the ads photos to make your own determination of this items condition. We have an extensive inventory of vintage and current celebrity autographs, original photos, lobby cards and movie posters, so if there is a particular item that you are looking for, and don't see it on our other current listings. 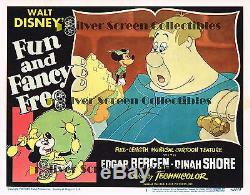 The item "WALT DISNEY'S FUN AND FANCY FREE STARRING MICKEY MOUSE VINTAGE LOBBY CARD" is in sale since Wednesday, June 21, 2017. This item is in the category "Entertainment Memorabilia\Movie Memorabilia\Lobby Cards\Originals-United States\1940-49". The seller is "silver-screencollectibles" and is located in Hawthorne, California. This item can be shipped worldwide.